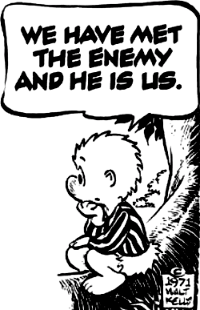 The problem today is bureaucracy and its companions — fear of competition, change and stepping out of line. Twenty years later, time has eroded each of those obstacles. China and other nations have filled the gap left by US Internet infrastructure suppliers — Huawei has replaced Cisco and China played a major role in the financing and construction of the undersea cable connecting Cuba and Venezuela. While Cuba remains poor, the economy has improved since the special period and there is frustrated demand for Internet service. This should have fueled government and/or private investment, but it has not. Cuba's Human Development Index — a measure of national income, health and education — is the second highest in Latin America and the Caribbean, but it is the least connected nation in the region. Finally, the Cuban government points to USAID projects like ZunZuneo and the Alan Gross affair as proof of a US war on the regime. That makes for good propoganda and provides an excuse for Cuba's lame Internet, but I think Cuba's leaders are smart enough to realize that these efforts, had they succeeded, would have been drops in the bucket. Furthermore, Cuba has had twenty years to observe nations like China, which encourage the Internet while selectively blocking content and, more importantly, surveilling users. 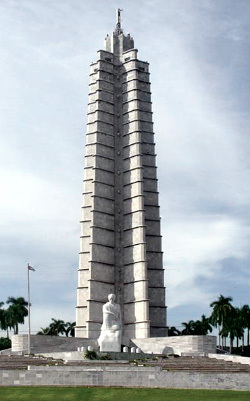 José Martí Memorial. He was honored by Reagan, Castro and Obama.It would be depressing if that were the end of the story, so let me digress on what makes Brooks optimistic. When he met with Cuban artists, he felt "a sense of national solidarity and a confident patriotic spirit that is today lacking in the United States." He attributes Cuban national pride to their impressive cultural achievements and singles out the writing and life of José Martí, the 19th-century poet and journalist "who shifted the national imagination, who told Cubans who they were and what their story was" — inspiring a "common faith in a dignified future." Martí died fighting for Cuban independence from Spain, but feared the possibility of a cultural and economic takeover by the United States. You have to admire a man who both sides of the Cuba debate claim as theirs. He is Cuba's national hero, but, when the Reagan administration began broadcasting "Radio Free Europe/Radio Free Liberty" to Cuba, they named it "Radio Martí" and Obama honored him during his recent Cuban trip. Brooks writes that he "was amazed how much Martí's name came up in conversation [during the trip] and how little Fidel Castro's did." The grip of bureaucracy on the Cuban Internet is not unique. Bureaucracy arises wherever game-playing, not merit, determines success. Excellence and hard work — "rate busting" — can become liabilities. Many nations have made transitions since the dissolution of the Soviet Union — Cuba is only the latest. Cuba can consider and learn from the Internet strategies of nations from Estonia to Russia. (That should be an easy choice). Cuba is also free to consider the Internet infrastructure ownership and regulation policies of non-Soviet governments and create a uniquely Cuban Internet — one that benefits the Cuban people and provides ideas for the rest of the world. A version of this post was originally published on The Internet in Cuba blog. Cuba's recent home Internet expansion provides an example of the impact of stultifying bureaucracy when compared to home connectivity in the US. If I go to the Web site of my home ISP, I am given a choice of three plans — each with a different speed and price. If I go to ETECSA's home Internet site, I find four-speed options (1,2,3 or 4 Mbps) and 85 frequently asked questions (FAQs) describing the service. ETECSA's home service also seems to differ from other nation's in that the account is not associated with a home, but with a user. If two or more Nauta users live in the same home, would they each be expected to have accounts? It seems there is some flexibility in the place from which one uses their account — home, a WiFi hotspot or a fixed "navigation" facility, but my wife lost patience and was not willing to humor me by continuing to study the FAQs. My favorite FAQ is number 84 — "Why is the navigation slow?" Their answer is that it could be many things and they list four that might be wrong with the user's computer or configuration but don't mention network congestion or the fact that their offering is too slow for today's dynamic, multimedia Web pages. Local Time: Wednesday, April 24, 2019 12:58 PM PDT – Page Load: 0.3320 Sec.